Rustic Hanging Heart Family Plaque - Pretty, shabby chic hanging heart decorative plaque with thoughtful Family quote. Decorated with little wooden hearts encirling a wire hanger, Rustic Hanging Heart Family Plaque adds a shabby chic look, perfect for a country cottage sytle home decor. Little wooden hearts in white and natural wood finish with a large heart decorated with a meaningful quote, "Family is a gift that lasts forever". Rustic Hanging Heart Family Plaque - Pretty, shabby chic hanging heart decorative plaque with thoughtful Family quote. Decorated with little wooden hearts encirling a wire hanger, Rustic Hanging Heart Family Plaque adds a shabby chic look, perfect for a country cottage sytle home decor. 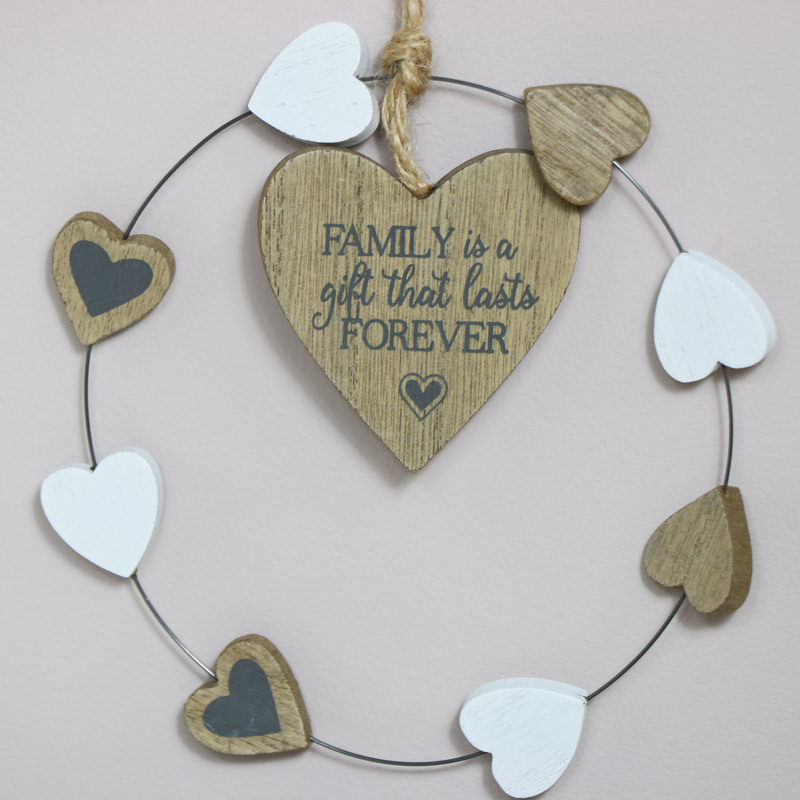 Little wooden hearts in white and natural wood finish with a large heart decorated with a meaningful quote, "Family is a gift that lasts forever". 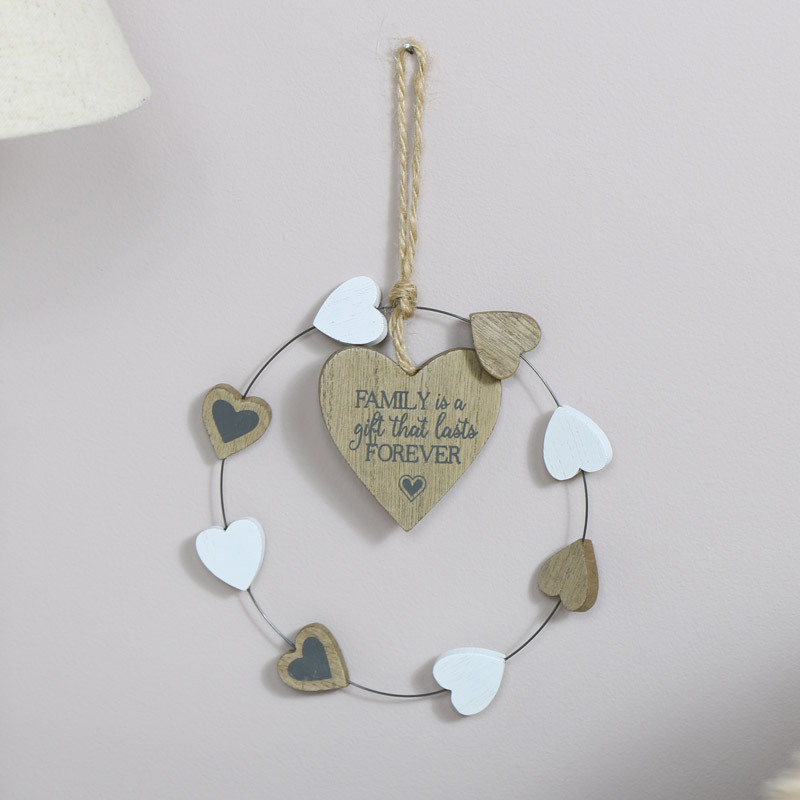 Round wire frame with wooden hearts in white and natural wood finish. Easily hung from twine hanger.